"The first quarter of 2015 will look atrocious, because the oil shock is a big deal for us". That's what Bank of Canada Governor Stephen Poloz told the Financial Times in an interview on March 30. Since then, quite predictably, Canadian economists and financial journalists have been debating the meaning of the word atrocious. One observer cited Merriam Webster’s online dictionary definition of the word atrocious as “of very poor quality … appalling … horrifying”. Most economists who have weighed in on the debate have argued that the 1Q15 economic data seen so far does not meet the definition. In spite of that, these same economists, after being shocked by the BoC's January rate cut, have been busy revising down their growth and inflation forecasts. Most of the sound bites in this debate have been reactions to individual economic releases. For example, real GDP declined by just 0.1% in January and economists judged that to be weak but not atrocious. The economy added 29,000 jobs in March and, while the jobs were all part-time, that didn't look atrocious. But these data points give a very incomplete picture of how the economy performed in 1Q15. A preliminary estimate of real GDP for the quarter won't be published by Statistics Canada until May 29, so we must judge the quarter so far by a wide range of monthly economic indicators, the same indicators that the Bank of Canada will utilize to update its economic projections to be released in the Monetary Policy Report on April 15. The first place to look is at the source of the shock: the decline in the price of crude oil. OK, that's atrocious! 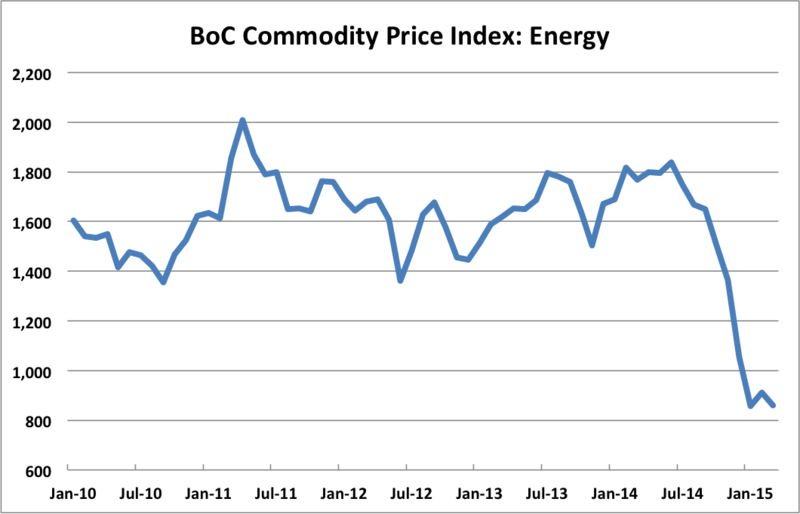 The price of energy commodities produced in Canada fell 53% from June 2014 to March 2015 with the bulk of the decline occurring in the December to March period. So what is the direct impact? 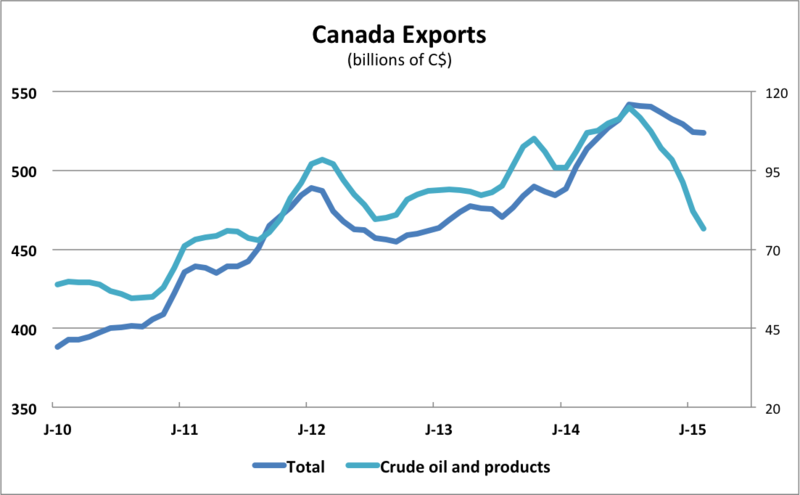 First, lets look at Canadian energy exports, which account for about half of Canada's total exports. In the three months to February, the value of energy exports fell 22% (or 63% at annual rates). That's atrocious! The plunge in energy exports pulled down the value of total exports by 1.6% (or 6.2% ar) over the same period. That's weak, but not atrocious. In volume (or real) terms, total exports are on track to be down 1.2% ar in 1Q15, after falling 3.0% in 4Q14. Soft, but not atrocious. While the value of energy exports has collapsed, the impact on total exports has been negative but not disastrous. The next place to look is business investment. Governor Poloz told the FT that capital expenditures could fall by as much as 10% as a result of energy companies cutting back on investment. The energy sector has been the leader in rising business nonresidential investment in Canada in recent years. While there is little direct evidence on business investment in 1Q15, the Bank of Canada's Business Outlook Survey shows a weakening in investment plans. Weakness in investment intentions was concentrated in the goods sector and among firms that reported being adversely affected by lower oil prices ... Although firms outside the energy sector report that the outlook for U.S. growth and a weaker Canadian dollar are generally favourable for them, the positive impact on their investment intentions is taking time to materialize. 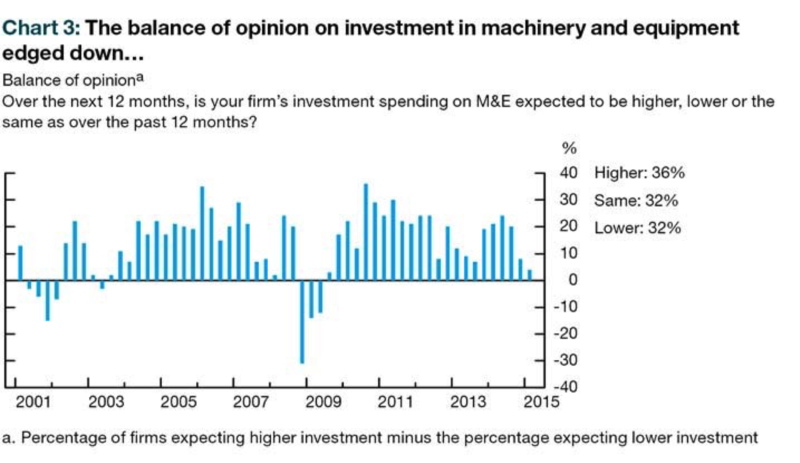 Machinery and equipment investment is only part of the business investment picture. Non-residential construction is another important component. Here once again, we have little direct evidence, but we can look at building permits. The value of permits for non-residential construction in the first two months of 2015 were down 22% (or -63% annual rate) from the fourth quarter level. Now that's atrocious! Let's turn to residential construction sector. Many observers have noted that while housing activity remains strong in central Canada, the impact of lower oil prices is weighing on the the residential real estate market in Alberta and other energy producing regions. Housing prices are still rising in Toronto and Vancouver, but are falling in Calgary and Edmonton. But what about residential building permits and housing starts. The value of residential permits in the first two months of 2015 were down 7% (or -25% annual rate) from the fourth quarter level. That's verging on atrocious. And housing starts were also down sharply. Single-family housing starts fell 10% (or -35% ar) while multiple unit dwelling starts fell a more moderate 2.4% (or 9%ar). What about consumer spending, which was supposed to benefit from lower gasoline prices. Real retail sales fell 1.2% in both December and January, which puts sales volumes on track for a 7% decline at annual rates for 1Q15. That's very weak! We could be surprised by a retail sales rebound in February-March, but I doubt it. More likely sales fell further in February and posted a modest rebound in March. The PMI, a diffusion index, fell below 50 in February and March, posting its lowest readings since its inception in late 2010. 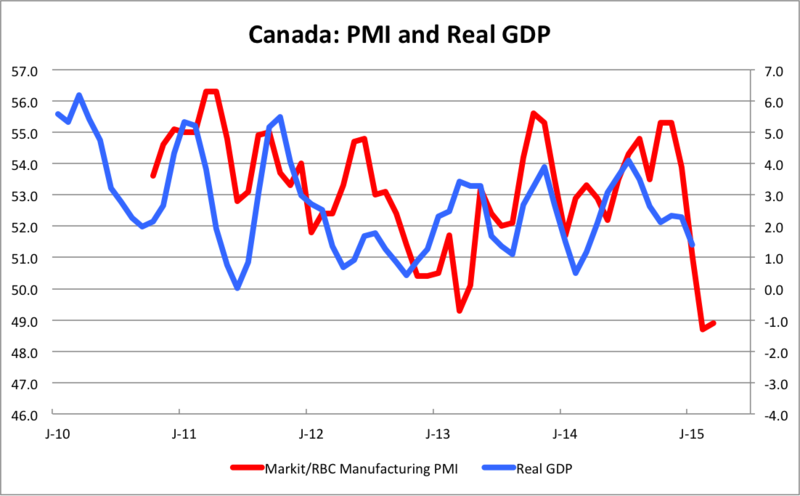 Although it does not have a long history, it correlates relatively well with the rolling 3-month annualized growth rate of Canada's real GDP, shown by the blue line in the chart. It suggests that further weakening of real GDP growth in 1Q15, to somewhere in the -1% to +1% range. But what about employment and those 29,000 jobs in March? As mentioned, the economy actually lost 28,000 full time jobs and added 57,000 part-time jobs. Total hours worked, a better measure of labour input barely grew at all in 1Q15, rising just 0.3% ar, in line with very weak growth or even a modest decline in real GDP. Was the Atrocious Comment Justified? On balance, I would say yes, the plunge in crude oil prices did have an atrocious impact on 1Q15 growth. The data on 1Q15 that we currently have in hand is mixed between soft, very weak, and atrocious. In my opinion, it is weak enough to justify a further downgrade in the Bank of Canada's projection for real GDP growth in the April 15 Monetary Policy Report. In this sense, the comment was justified, albeit somewhat bold. Is it weak enough to justify another 25 basis point cut in the policy rate to 0.50%. In my opinion, yes it is. Some observers believe that 2Q15 will post a meaningful rebound in growth. With the price of oil still barely above $50/bbl, I don't see why a strong rebound should be expected. Poloz has taken a lot of criticism for surprising economists and markets with the rate cut in January. However, the negative impact of the oil price plunge on the Canadian economy is being borne out by the data. If the BoC cuts the policy rate again on April 15, his critics won't be able to say that he didn't warn them.